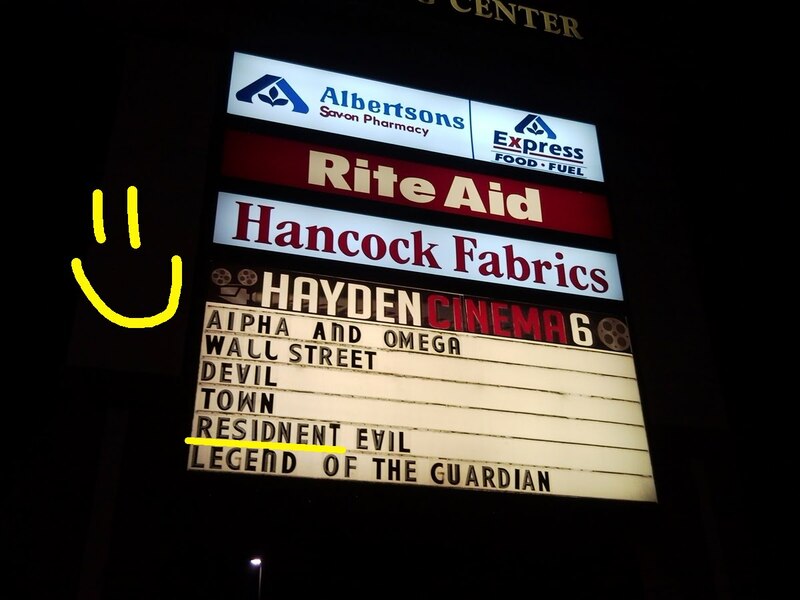 It's been two weeks since I posted about the misspelling of Resident Evil at the Hayden Cinema 6. TWO WEEKS! 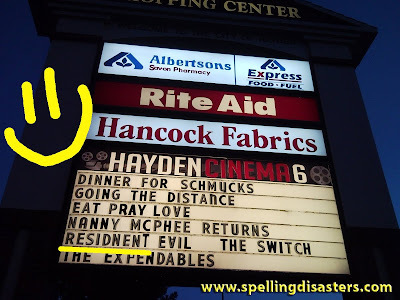 They have gone up on their ladder twice to change the movies and they couldn't fix the Spelling Disaster? What's going on over there at the cinema? What?? A few months back I quit (cold turkey) playing a bunch of games on Facebook. Curiosity got me the other day so I popped into Cafe World where I was greeted by a zillion pop-ups and this Spelling Disaster. We can always count on zynga for a perfectly placed SD! 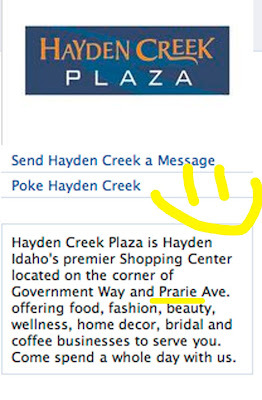 So many words that could become Spelling Disasters and Hayden Creek Plaza SDs their location. I wanted to let them know but their privacy settings don't allow for someone who is not their friend to post on their wall. That's kind of like keeping the front door of your business locked unless a customer knows your secret password. I could message them, but where's the fun in that? When Did She Welcome Him? Submitter Bryan writes: Newsnight is the flagship news and current affairs program on the BBC here in the UK. 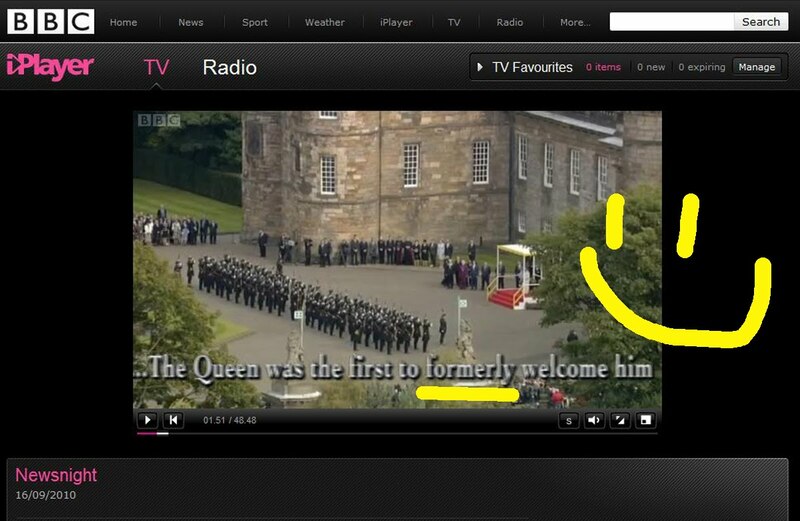 So, when reporting on the Pope's visit, you'd expect them to know the difference between "Formerly" and "Formally"! It's good to know the media in the UK is as diligent with their word usage as the US media. Apparently news coverage about the Queen and the Pope isn't worthy of an editorial double-check. 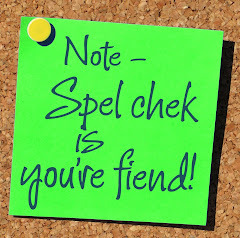 I'm going to formally sign-off today and go check to see if my formerly brewed coffee is still hot. 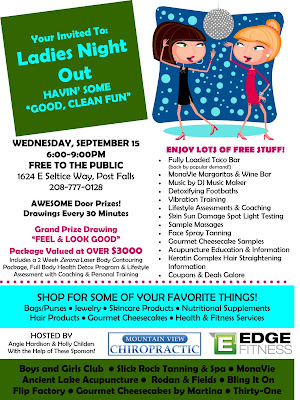 I'm not sure what upsets me the most about this invitation to Ladies Night Out in Post Falls, Idaho. 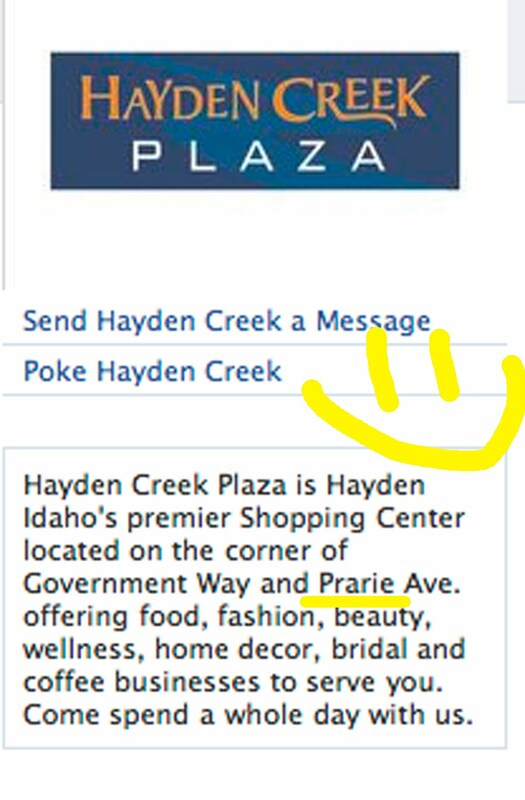 Sure there's the Disastrous Spelling of you're, but having the phrase "Good, Clean Fun" in quotes really makes me wonder. 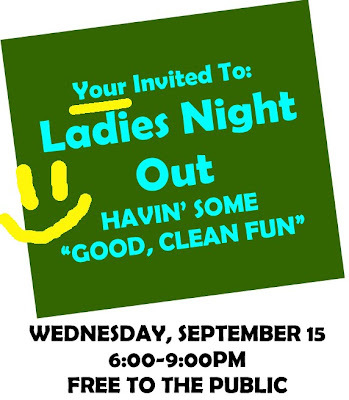 What kind of "good, clean fun" do they plan to have? Is it, you know (wink wink)... Good. Clean. Fun (wink wink). 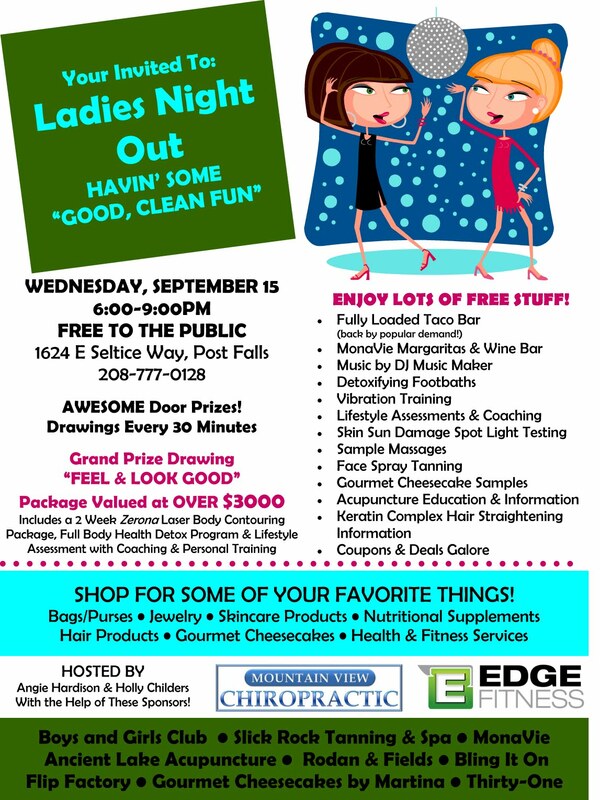 I'll be there in a heartbeat if that (wink wink) Good, Clean Fun (wink wink) means margaritas, loaded taco bar and cheesecake! Oh... and hot, shirtless men serving said delicacies. What? Am I asking too much? Maybe it's really just an opportunity for some businesses to get you to open up the wallet and spend, spend, spend. You'll have to spend after getting your face spray tanned. Who wants a bronzed face to go with their lily-white body? And don't get me started on the gourmet cheesecake samples! They get you hooked knowing you will be back to buy more. Pushers. And once you're addicted to the cheesecake, you have to sign-up with a personal trainer. It's all a vicious cycle! The nice folks at the Hayden Cinema are at it again. 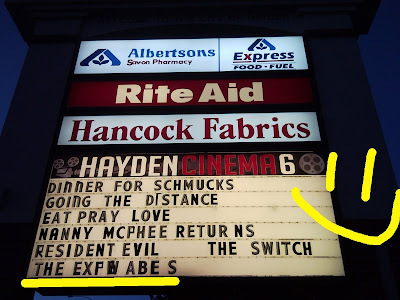 I especially love that "resident" and "expendables" are correctly spelled on one side of the sign. 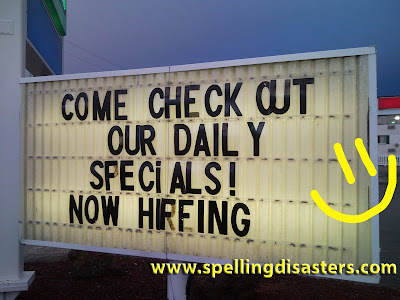 How does this sort of Spelling Disaster even happen? Really. How? While shopping at the Humane Society Thrift Store on 3rd Street in Coeur d'Alene, my oldest daughter noticed this interesting category of books. What might be included on those shelves? The History of Pop Culter? Bio-Culter in the Next Millenium? The Culter of Fear? People and Culters? 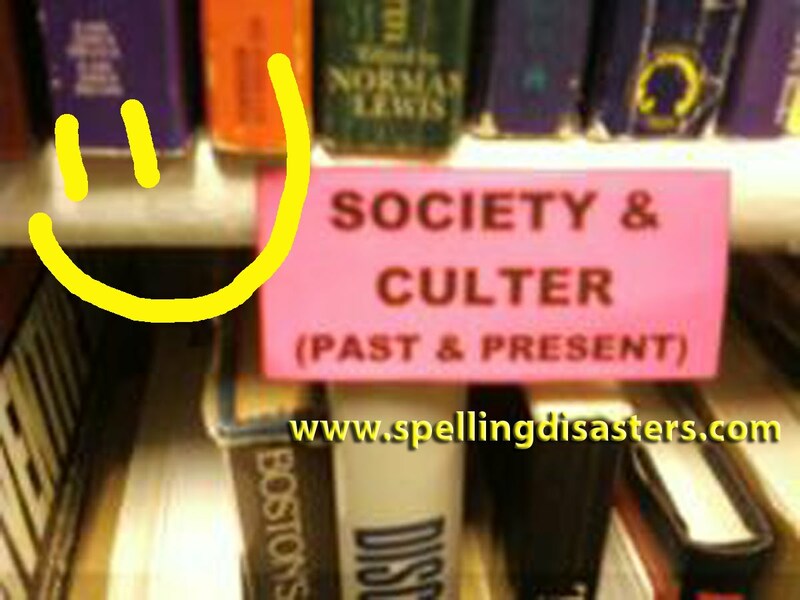 I believe the one book that is not sitting on a shelf at the HSTS is a dictionary. Does anyone have an extra they can donate? 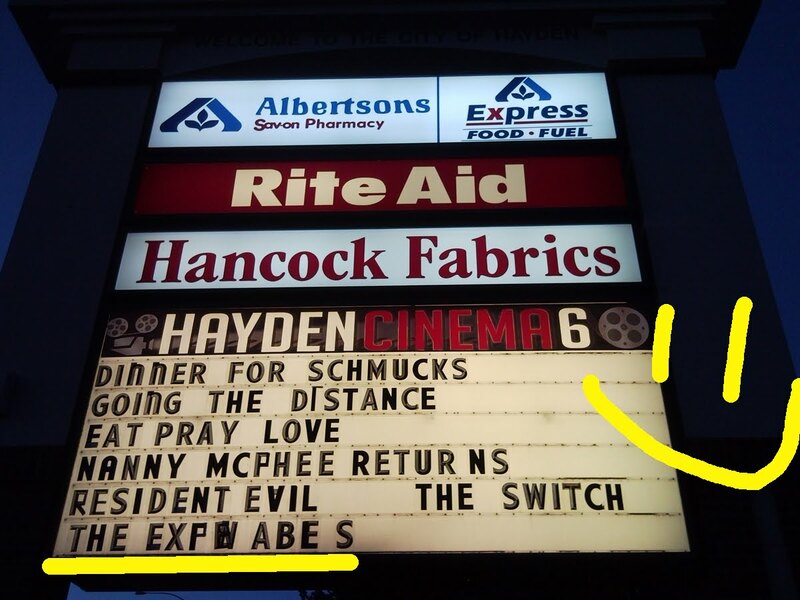 My daughter spotted this at the Exxon station on the corner of Appleway and Hwy 95 in Coeur d'Alene, Idaho. I particularly love that they used excess Fs to create a P, R and the unnecessary E. The upside down exclamation point is pretty creative, too. I wonder if the marker wore off after it rained last night. NOW HIFFING... yes, that would be awesome! Maybe they were hiffing gas fumes. That would explain this Spelling Disaster. "Stop the car, Honey!!! 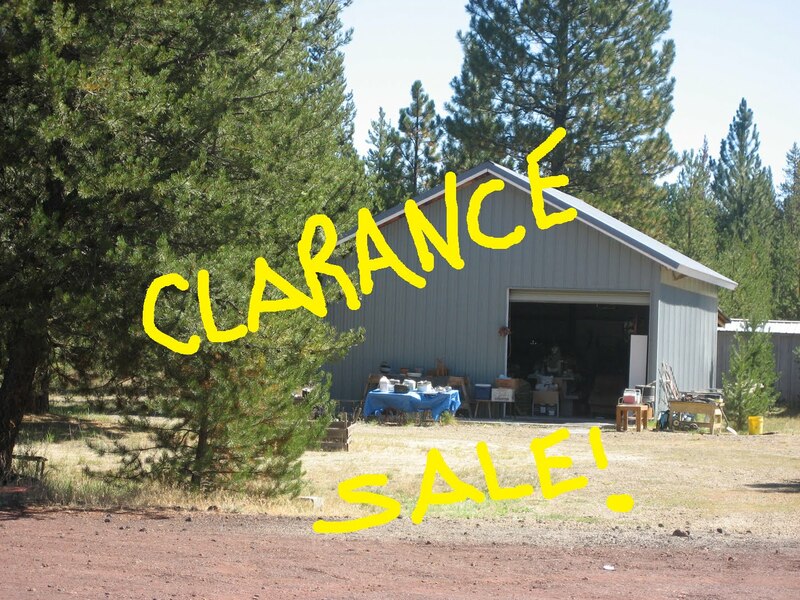 It's a Clarance Sale!!" I said as my husband and I were driving through Central Oregon on Friday. He didn't stop the car, so I spent Labor Day weekend hoping the folks having the Clarance Sale would still be selling on Monday when we would be driving home. 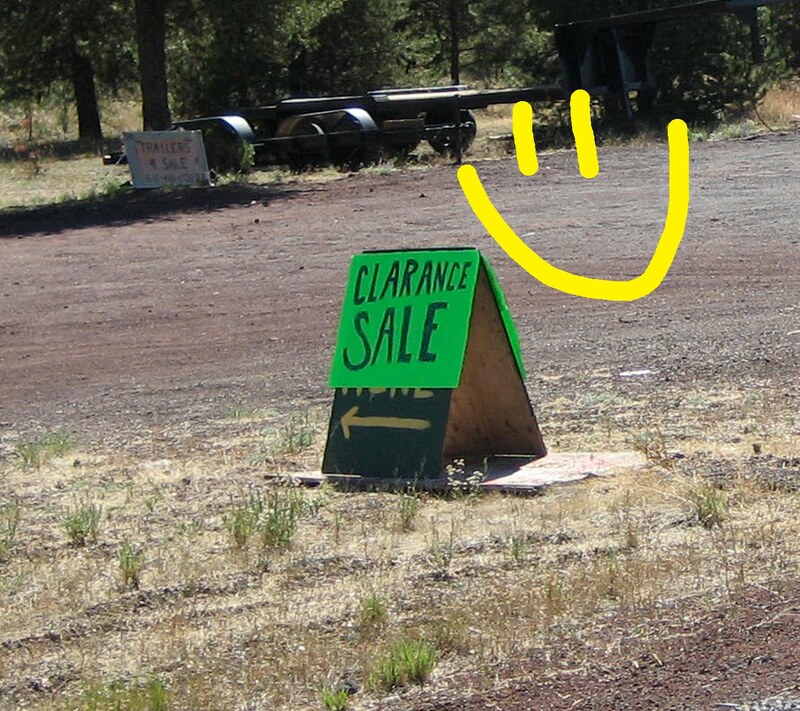 As Spelling Disaster luck would have it, the Clarance Sale was indeed still taking place! 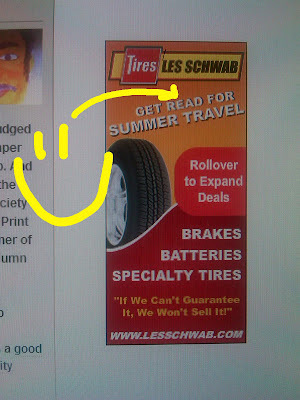 It looks like the good folks at Les Schwab Tires are promoting summer reading. Silverwood Theme Park has their "Reading is the Ticket" incentive for school kids... the kids get a free pass to the park after completing 10 hours of reading during summer break. 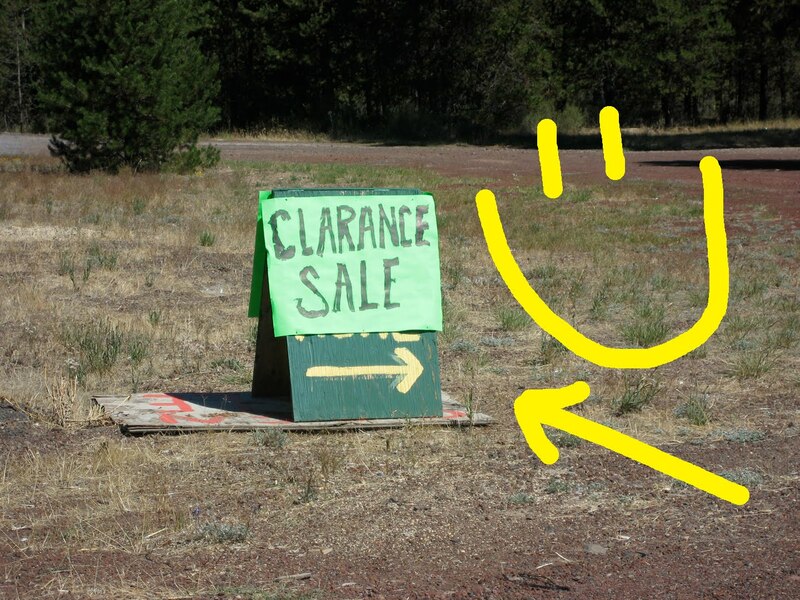 What do you think Les Schwab's incentive is? A free tire rotation? Maybe new brake pads (labor not included)? I bet it's a pack of their "Free Beef"!! Thanks to Megan who spotted this on Huckleberries Online.